Playing everything from Minecraft to Ark, and 7 Days to Die to Trove, all of my experiences have one thing in common – I inevitably get bored. You see, it’s all well and good having an elaborate crafting system that allows the building of all sorts of equipment and impressive bases, tools that help you shape the very world around you however you see fit, but why? What’s the eventual point? Obviously, this is a very subjective thing, and a huge number of gamers can happily spend countless hours living in these virtual worlds, revelling in the customisation that’s on offer. Simply building creations using this form of digital Lego is enough to keep players happy and engaged for the long haul. For me, though, I quickly tire of this, and eventually question why I’m spending all of this time grinding, farming and, building. Yes, I’ve got a cool-looking domicile and some nice weapons, but what now? What’s the point? Just continuing to survive isn’t really something that appeals to me in the long run if there’s no end game, no goal to achieve. I get enough of this in real life. In a game, I want to work towards something, I want a big bad to defeat, or a world to save. Something tangible to aim for. For this reason, although I certainly don’t deny the quality and appeal of the likes of the aforementioned sandboxes, eventually, they’re just not for me. Conan Exiles, however, is a game I quickly took notice of. 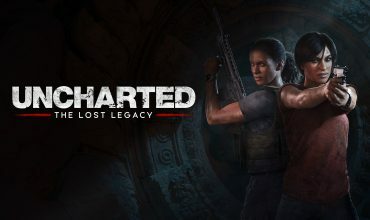 I initially saw it and dismissed it as nothing more than yet another survival game, but as more information rolled in, it appeared I was wrong. Instead, this was a game that provided the survival, base building elements, which I do actually enjoy for a while, and fused it with a proper RPG structure and quest. 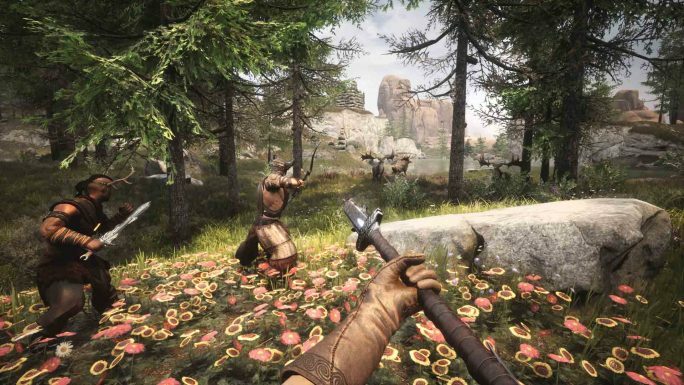 A game that appears to take the building and research elements of Ark, and the adventure and questing of Skyrim. A match made in heaven, eh? Certainly on paper, but it remained to see how this would translate into an actual game. You don’t exactly start off your new adventure in the best of shape. Nailed to a cross in the middle of a desert, you’re pretty much done for. That is, until Conan rocks up, cuts you down, gives you some vague pep talk, tosses you a water flask, and leaves you to it. From this point, you’re on your own, and it’s up to you to go from nothing, to fortress-owning warrior, complete with servants, the best weapons, and the will to forge your destiny in this dangerous and varied world. At first, the game feels almost identical to the likes of Ark. Indeed, the mechanics, menus system, levelling, it’s all practically a carbon copy, except for a focus on third person combat. At first you have nothing, and you need to find basic materials to make crude tools, weapons, and armour. You have to find food and water, build a simple hut, and generally settle in to the world. From here, you’ll level up, learn new crafting abilities, become more adept at fighting, and slowly work your way up the food chain. It’s very familiar stuff, and as seems to be the case with the genre, the game is also very rough around the edges, with choppy frame rates, glitches, clunky controls, and often irritating camera (especially during combat). Even with these, though, Conan Exiles appealed to me much more than most games in this genre, and the combat, setting, and fantasy style works fairly well with the survival mechanics. I ploughed on, learned how to make better equipment, spent hours farming materials, and got to the point where I could venture off into the world. 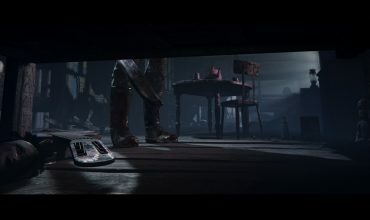 Doing so, I found genuinely different and engaging areas to explore, a range of enemies to deal with, and eventually, even RPG-style quests and goals, the feature that had drawn me in in the first place. It took a while to get there, but eventually I found some actual action RPG content under the survival gameplay. Yeah, take on the guy ballsy enough to fight three guys at once who’s already covered in blood. Great idea. Although nowhere near an actual RPG as I had hoped, Exiles does present some decent, RPG-style content, including interesting dungeons with decent boss encounters, and if you dig deep within the game, you’ll uncover the story hidden below the depths of survival mechanics. It really is worth putting in the time so you can explore these dangerous areas, not just as it’s a way to earn the best rewards and materials, but as it draws you into the world even more, knowing there’s actually a reason for you being here, and powerful beings to confront. Hell, if you advance enough, you can even summon a huge deity to do your bidding, stomping around to decimate your foes. Returning to the base building, I have to say I found it to be amongst the easiest to manage so far, even more so than Ark’s approachable construction. The resource requirements for many items are way too high, and the game I feel enforces far too much of a grind, but for the most part, it’s all about progression and working to improve your means. To help you out you can capture and break ‘thralls’ using your wheel of pain. This is a contraption that basically creates your own army of slaves that you can control, assigning them to various tasks from basic farming and crafting, to actual base defence. This is a definite advantage if you play online and in PvP servers, where you’ll always be on the lookout for enemy players looking to cause some grief. 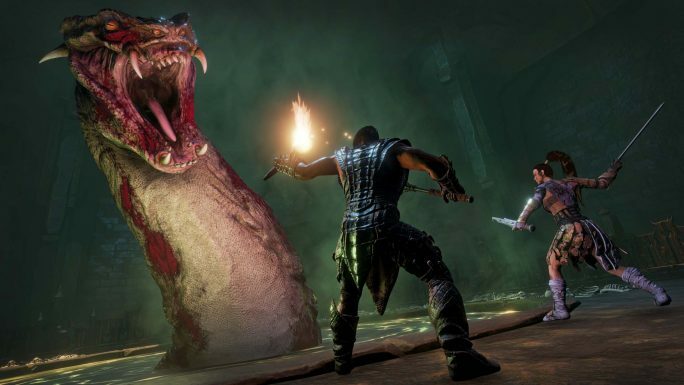 Of course, this brings us to the best way to play the game, and as always with the genre, Conan Exiles is at it best when played online with friends. You can play the entire game solo and/or offline, and for some this will be perfectly fine. However, if you want to get the most out of the game, and wish to build truly huge fortresses and take on the most dangerous dungeons, it’s best done with a group of people working together. If you’re the more combative type, PvP servers are where you’ll have the most fun, just be prepared, and make sure you know the game, as you’ll get no quarter from your competing players. It can be rough. This brings me to the game’s biggest issue, though, and that’s the rather surprising lack of quality in the combat. It’s not terrible, but the third person combat is just way to clunky, with an often broken auto-lock on, a camera that can far too easily become lodged in larger enemies, and collision detection that seemingly makes up the rules as it goes. It’s all very janky, and as this is a game licensed on Conan, a franchise all about brutal combat, it really sticks out. Even with the tepid combat, and an over reliance on endless farming and grinding, I did find Conan Exiles to be more interesting than most similar games, and the well designed world and challenging dungeons help to create a more involving experience, and one that managed to keep me engaged for quite some time. 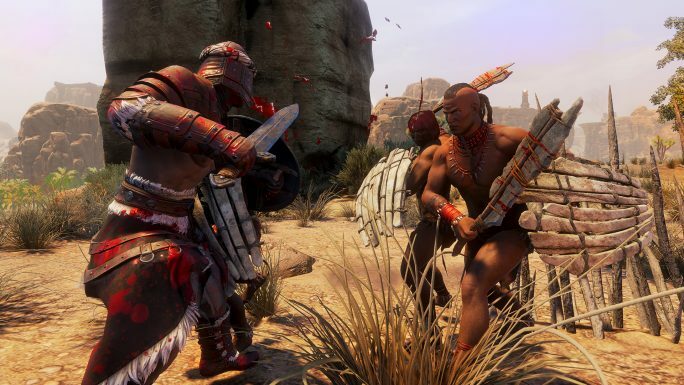 Although it didn't turn out to be the survival/RPG hybrid game I'd hoped it would be, but Conan Exiles still manages to deliver a solid survival experience. Base building is handled well, with a robust crafting system, and when played with friends, it's all good fun. Sadly, the combat and rough presentation let it down, and even with enjoyable dungeons, the game eventually becomes another endless chore or farming, grinding, and time management. Wow, I managed to get through the whole review without once mentioning the customisable privates... Ahhhh, dammit!